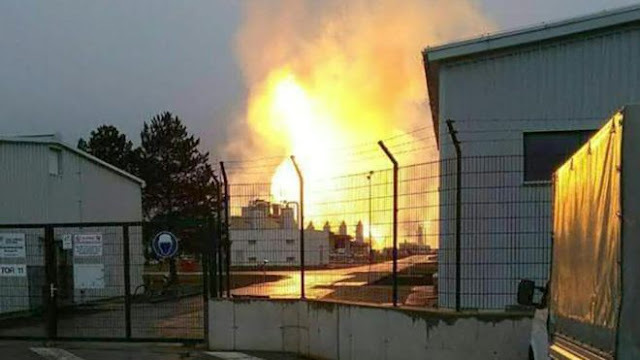 A deadly explosion and fire that ripped through Austria's main gas pipeline hub has caused Italy to declare a state of emergency due to a lack of supplies. One person was killed and 18 injured in the blast on Tuesday in Baumgarten, eastern Austria. A police spokesman said: "There was an explosion around 8:45am (0745 GMT) and a fire. A wide area has been sealed off and there are expected to be several injured." In Britain, Europe's biggest gas market, gas for immediate delivery rose 35% to 92p per therm, its highest level for four years. Gas Connect Austria, which operates the Baumgarten site, said the blaze had been brought under control. Police said the cause was technical in origin. Footage on social and other media showed a column of flames rising from the site. The hub is important for European gas transit, with natural gas transported to Baumgarten through Slovakia and Germany along several pipelines. Gas flows are then delivered throughout Europe via Austria's transmission network. Gas Connect Austria said deliveries to Austria's southern and south-eastern borders would be affected until further notice. Italy's industry minister said the country must grapple with a "serious" energy supply problem. Slovakia's main gas transit route to Austria was suspended after the fire, said the Slovak pipeline operator, Eustream. Russia's Gazprom Export said it was trying to redirect gas flows and secure uninterrupted supplies. Gas prices elsewhere in Europe soared on concerns about supply. The Italian wholesale day-ahead price surged 97% to a record high of €47 per megawatt-hour.